Here in France Halloween isn't celebrated as exuberantly as it is in say the USA, or Canada. I know that I have to get ready for Trick or Treat Night. invade the lanes of our village. and an outdoor lamp shining. If we don't want to play be disturbed we just leave all the lights off. 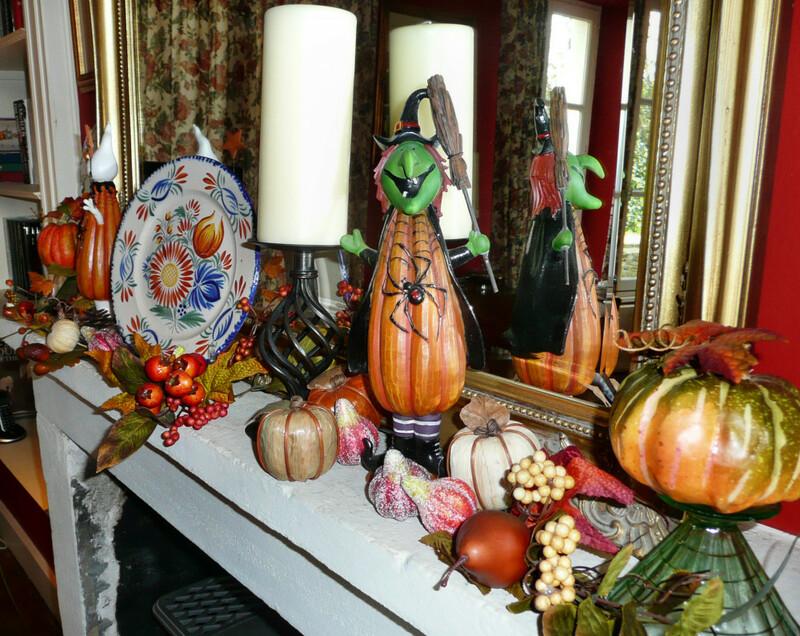 a few Halloween touches here and there. 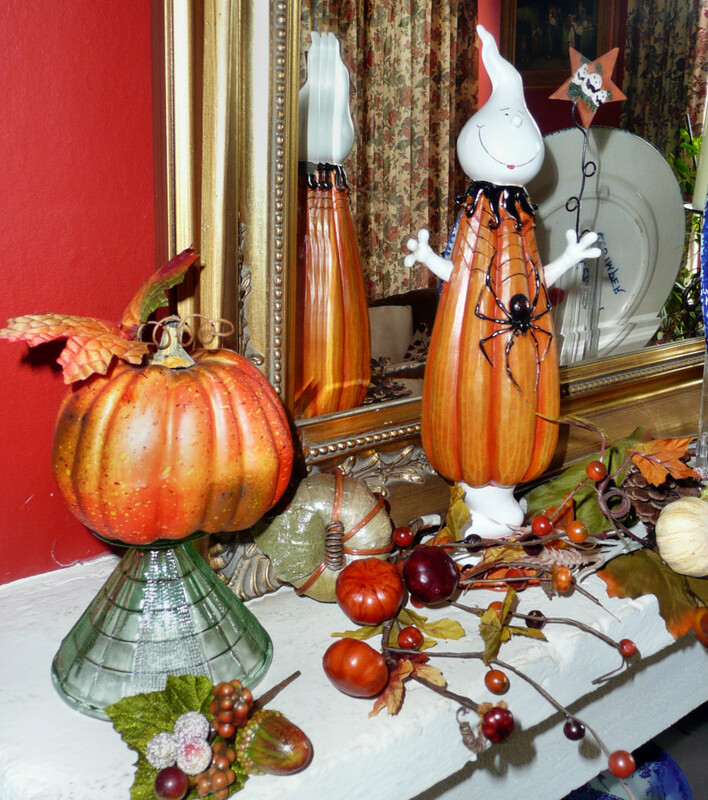 On the library mantlepiece - witches, ghosts and pumpkins. on either side of the fireplace . I'm sure there'll be lots more ghouls and ghosties there. Happy Halloween - sounds like lots of fun. I have carved my lantern and will put it outside - providing the rain stays away. It looks like they have a lot of fun. There is not much halloween in our country. So interesting to see the what and how of Halloween in your country. Some of my best childhood memories were of Halloween night. It was more about dressing up, and being out at night, etc, than the candy. Nice of you to participate with your village. 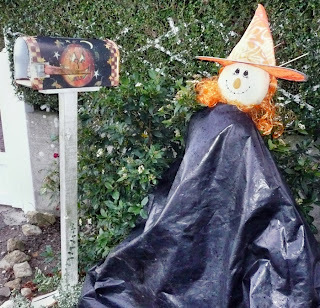 So fun seeing a slice of Normandy Halloween. And, I love your witchy quimper plates. Visited your Quimper blog and enjoyed learning more. Thanks for visiting Moonbeams and Fireflies. 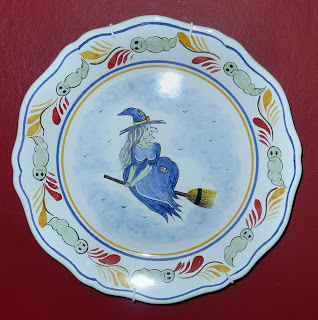 I'd never have thought there'd be a witchy Quimper plate! I look forward to seeing some photos from a French Hallowe'en. I'll be going around with two little boys bundled up against the Ontario cold! Looks like you are all ready for your little neighborhood visitors. Fun decorations. Love the Quimper Witch plate. Happy Seasonal Sunday! Yikes, I need to buy loads of Halloween candy tomorrow for the Trick or Treaters. I wanted to wait until the last minute so I wouldn't eat any of the candy beforehand! Great picture of your neighbourhood trick or treaters! We are ready too here on the farm but there are so few children living in our area now we often don't see any knocking at our door. Our pumpkin is carved and the treats are ready just in case. Happy Hallowe'en! Happy Halloween. 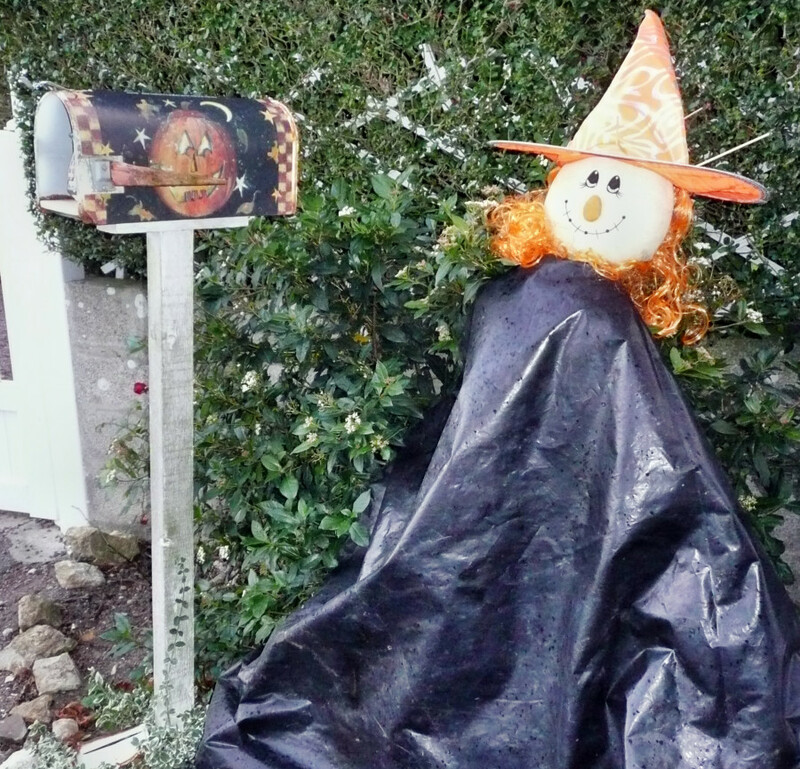 Since we moved, we don't have trick or treaters--too far off the main road now. You will enjoy the festivities. Your decorations are really pretty. i'll take a halloween bon bon anyday! love those witch plates, never seen those before. I love the civilized note and the recognition that not everyone wants to "play" Halloween. In our neighbourhood no children came last year and I missed seeing them in their costumes. It's unlikely anyone will come this year either. le sigh. 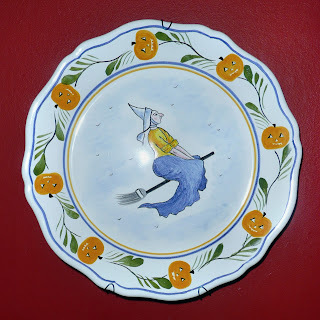 Maggie, I am insane for your Quimper witch plates! How adorable! Love that you have Halloween too...we make such a big deal out of it. More so in the northern states, but we get decorated in Florida too. Hopefully, the downpour we've been having for days will let up for tonight! I love the picture of the neighborhood children all dressed up. And who knew Quimper made witch plates? So cute! Oh my goodness, what wonderful little Quimper witch plates! You had so many cute little goblins come down your lane collects treats. :-) It's great to see the kids having a good time. 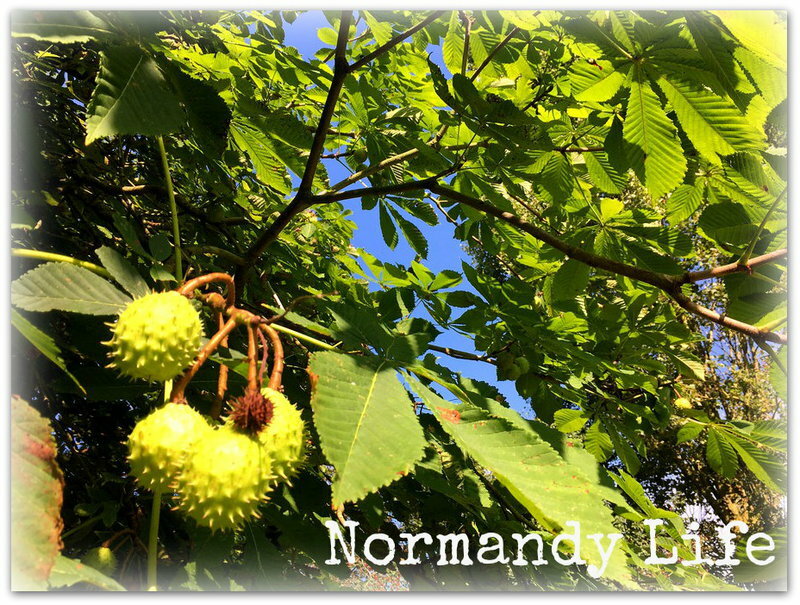 Lovely blog capturing seasonal life in Normandy. 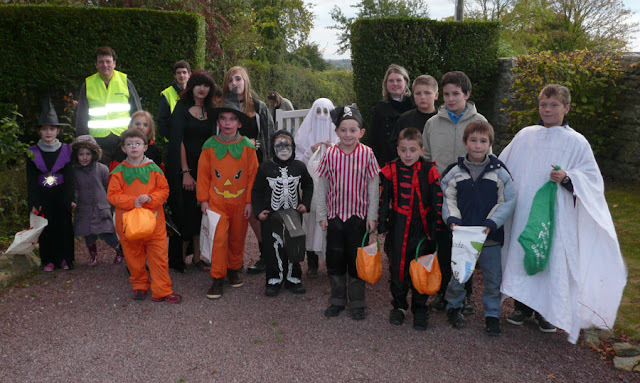 Halloween is very much a children's holiday in France - not many adults dressing up! As you know, I didn't pull out any of my Halloween things this year. Fun to see your shots. Fun to see the bunch of trick or treaters at your gate.